This Oriental design is on an off-white background in dove gray, light gray, forest green, yellow-gold, light mauve, and black. It has two button cuffs and a traditional shirt collar. It's 95% polyester, 5% nylon. 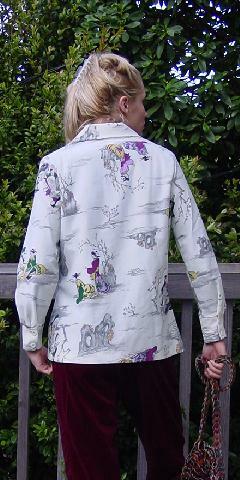 This vintage shirt jacket was designed for versatility and comfort, can be worn as a shirt or as a jacket over a blouse. Its size matches a 10-12. Eden got this in Miami and wore it several times and got lots of compliments each time, but the sleeves are a little short on her.